When I first got the chance to read Kate Atkinson’s Life After Life it was in German, and I have loved it since then and decided that I had to read the English original someday. It’s been a year since this novel was first published and Black Swan released a truly beautiful paperback edition of Life After Life this January. Fortunately, I was provided with a copy to read in a Lovelybooks online book club. Thank you Random House UK! 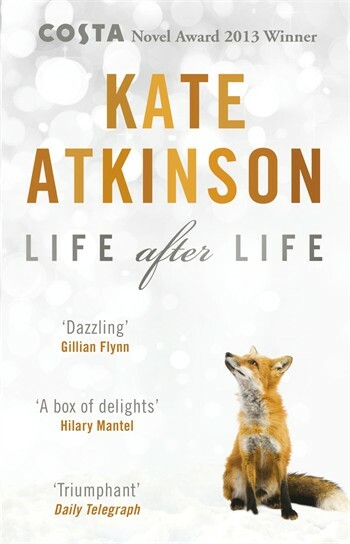 Life After Life is a 2013 novel by British writer Kate Atkinson. This review will be about the paperback edition, published by Black Swan in January 2014. As the title Life After Life suggests, Ursula Todd lives her life more than once. During the Great War, she grows up among her four siblings in England. In her numerous lives, Ursula relives the Great War and World War II, repeatedly travels to the continent and tries to find ways for people to survive. Kate Atkinson’s onomatopoeic language and her vivid descriptions make the setting of Life After Life very realistic. As mentioned in my first review, the reader constantly feels as if they were inside the book. Kate Atkinson also manages to create a different feel for every setting, that way, war for example does feel different depending in which country Ursula goes through it. Atkinson is brilliant at creating settings. Ursula, the main character, is a very flexible character. Although she stays the same person, she develops from life to life, adapting to the given circumstances. Another great character is Ursula’s mother Sylvie Todd. Sylvie is struggling with the changing society. The tension between the person she wants to be and the person she has to be is palpable. Unlike Ursula, Sylvie isn’t able to develop much throughout the book. Life After Life features a very unique plot. Even though Ursula’s life repeats itself multiple times, it never gets boring. When you first read this book, you have no idea how Kate Atkinson will make Ursula relive her lives. You will ask yourself if she has any control over the process or not. These are questions that you may find answers for in the book. Life After Life is a novel that caters for all tastes. It doesn’t fall short of sorrow and happiness and leaves more than enough room for thought. I loved this book. Destined to be a classic! I couldn’t stop thinking about it ever since I read it for the first time in September. And I noticed so many new things now that I reread it. Loved this book. Just noticed that you’ve read it too!